Love the mod. Currently using Viescraft-1.12.2-5.6.1.jar in SevTech Ages 3.0.8 and have noticed one very annoying thing. I'm having to resort to using expendable clay buckets to put gas in the engine, since I don't care if I get those back and they are far more renewable than the iron buckets or jerrycan. Barring an update is there anything I can do to patch the version that ships with 3.0.8 until the new SevTech final comes out, to prevent the buckets from being eaten? I have a problem, I'm playing on 1.12.2 and no matter what I try I can't build the engine or the ignition, I followed the guidebook and everything, even tried changing up the recipe and it just doesn't craft. But other than that this is one of the best mods I've tried. How do i change the speed of the airships on my multiplayer server? The VC config file in my server folder dosnt say anything about the ship speed. is there any vids for some tutorials and spotlight, I cant figure out how to use upgrades how to put it in do i have to place it in GUI or just add it while crafting one ship? This is exactly why I am redesigning this mod. I want things to be easier, more intuitive. The fact that I needed a guidebook means I didn't set things up right in the first place. I think with this old version, you have to go to the upgrade menu while in the airship, and place the upgrade in the correct slot and accept it. It is an incremental system so you can't just jump to a tier 3 from tier 1, for example. The new mod solves this. You just click on the airship, like using a healing item, to apply upgrades. There are more messages that pop up to tell you what is going on. I work full time and try to do this on the side while being semi social so I don't have time to make official videos. Not only that, I noticed that a lot of the videos are made with super old versions of my mod. Actually versions that get pirated from sites that shall remain nameless! They should at least steal the current versions to prevent confusion! hahaha! 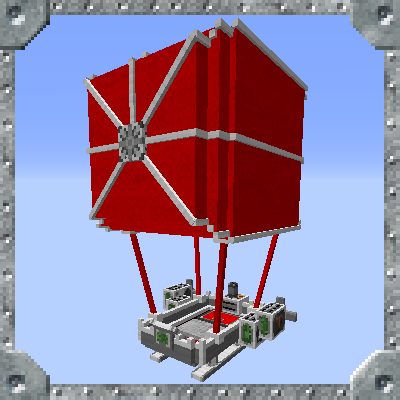 Is it possible to somehow limit the use of the airship to the overworld? Or just allow the airship in whitelisted dimensions. This is a good idea. I can put something in the configs for this. Make it do before you throw the airship, it does a check. Thanks for the idea! First I would like to say I have had this mod for about a year and love it. Amazing work. For various reasons, my friend and I decided to start a new server about a month ago. Did a clean wipe and fresh install using the latest updates for all the mods and a more up to date version of forge, but I was keeping stuff up to date monthly before that. We have advanced our base enough (Thermal Expansion) that we are ready for heavy duty exploring, which is where viescraft comes in. Everything built fine etc. Then we noticed that when we got in our ships, we could not open the aircraft GUI using the default "R" as we had before. I found a keybind that works for me that was clear and was able to do access and load fuel. However, now we realized we are unable to ascend via "spacebar". I'm not sure if you (the mod owner or anyone else who can help) would have a solution or know the cause, but up until about a month ago, we would multiple mods that in different scenarios the (jump when outside of the ship, ascend when in the ship for example) that all worked. I have tried googling various combinations of "minecraft" "forge" "shared" "multiple" "key" "keybindings" etc: I keep running into two year old posts on reddit about how you cannot multiple key bindings, but this mod worked out of the box without resetting keys basically just a few weeks ago. Unfortunately, I do not have the version numbers for what combination did work. Love the work and horribly confused. I am glad you are liking the mod! It is odd that you are running into keybinding issues. I am going to send you a message. If you are running your own server, I can hop on with you and see what is going on. Do some hands on troubleshooting. I played just last night with my newest release and the keybinds were working just fine. We will figure this out! Apologizes for taking so long to reply once I found the scenerio. Work + School + playing MC has been my stress relief. ... However, solved my issue. At some point the automated package management system decided that I need the newest hotness of java versions. I think part of the program's logic was that Java 1.8 hit End-of-Life at some point recently. Naturally, it wanted OpenJDK/JRE rather than the Oracle Java versions. That didn't work, so I tried Oracle Versions. That didn't work. Long story short: after completely removing anything related to Java, including a mind-boggling amount of system links, I clean/fresh installed Oracle's Java 1.8 JDK/JRE on *both machines*. Once that was done and after realizing there is some sort of call in the boot sequence (IE it didn't work after installing but did work after rebooting both machines), viescraft is working as advertised. There is a package setting in both APT and Aptitude that allows you to 'lock' a version to prevent it from upgrading. For ease, there is a human-package (something like JavaJRE and JavaJDK) that will update and then fetch the corrospending packages. I locked the file dependencies, so even if the human-friendly package updates, its dependencies will not. tl;dr: On Ubuntu-Linux, both server and client, you *must* have 1.8 Java, not "at least" 1.8 Java. And then lock your JDK/JRE versions to prevent further headaches. How do I make the balloon appear on top of the airship and not on the sides? It sounds like you are using a different Balloon frame. There are 2 models with the balloon on top. If you need help figuring it out, send me a message! What is happening? Feel free to PM me with the info. If you are on a server, I can hop in and help you out! Thanks for this mod! Im looking forward to submarines and ground machines! Sorry I totally missed this comment! Things have been steadily progressing. The list of things I wanted to add is getting smaller and smaller. I was expecting 1.13 to of been released by now. It must be one crazy overhaul. I think I may release the mod when I hit 3 million downloads for 1.12.2. It will be unique, because you will be able to use this mod and my new one together. The parts will not be interchangeable, but it is still neat! Right now, I am just building the mod from the ground up. 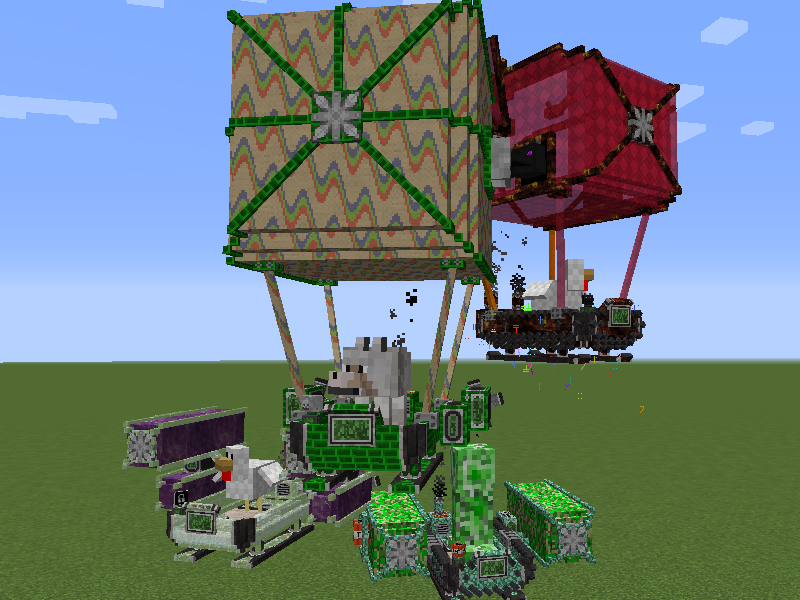 Airships will be the first machine added mainly because I have the models already made. From there, I will add the helicopter. Then branch to the Water and Ground mounts (really just need to tweak some of the movement logic and make the models).